Los Angeles ranks dead last for jobs. But the workers just keep coming. The latest report by personal finance site WalletHub finds that L.A. ranks dead last when it comes to "The Best Cities to Find a Job." WalletHub says it looked at the number of job openings, employment growth, unemployment, diversity of industry, the number of part-timers, the number of workers living in poverty and the cost of living. 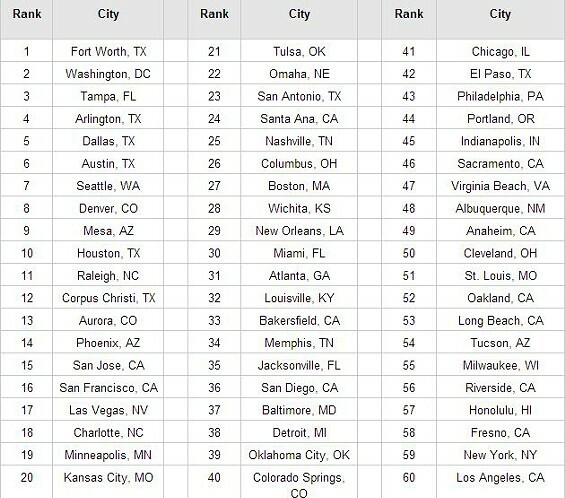 Of the top 60 most populous American cities, L.A. came in 60th. Los Angeles beat New York (# 59), Fresno (#58) and Riverside County (#56). The best cities to find jobs included Fort Worth (#1), Washington, D.C. (#2), Tampa (#3), Arlington, TX (#4), and Dallas, TX (#5). Silicon Valley, San Jose (#15) and San Francisco (#16) were not even in the top 10. Bakersfield, California was ranked No. 1 for "Fastest-Growing Workforce." The ease of finding work gives most people second thoughts about moving to LA. Jobs for recent collage graduates are scarce. Youth unemployment is at an all-time high. The only group that seems to be undeterred is the immigrant sector. Xin Xin Service is one of at least a dozen employment agencies that are gateways to a hidden economy, supplying businesses around the country with cheap Chinese labor. Stories emerge of dreams that have dead-ended in gigs as fry cooks, busboys, masseuses or nannies. It is a world that rarely intersects with mainstream America except through bargain goods and General Tso's chicken served at restaurant chains. Qiang Chen, 58, a veteran of the restaurant circuit, shook his head and scoffed when asked if he ever received overtime pay. "The bosses are bad. They should treat other Chinese well," said Chen, who has a green card. "Instead, it's Chinese taking advantage of Chinese. There's no job where you don't work at least 12 hours, from 10 in the morning until 11 at night."